For many women, one of the least-talked about but most persistent symptoms of hormonal imbalance is abdominal bloating. This is a common complaint for both men and women, since it can be caused by a variety of reasons; however, for women of reproductive age it is mostly related to hormonal imbalance. Bloating can vary in its severity, ranging from a mild discomfort and feeling of “fullness” to a strong swelling accompanied by growling and passing wind. 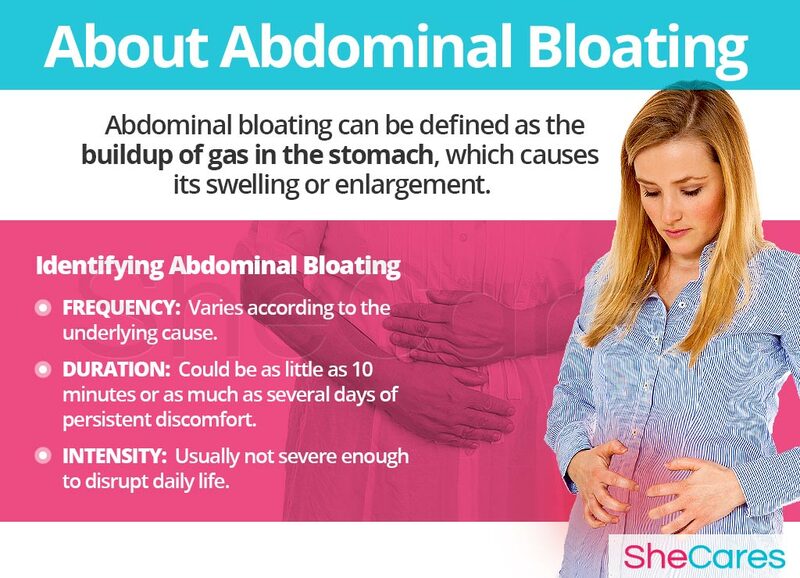 Continue reading to learn more about bloating, its causes, how it is connected to times of hormonal transitions, and the treatment options available. Around 21% of the population report abdominal issues to be a “significant problem” for their gastrointestinal health. Women are more likely to report it than men. Only 7% of people in one study reported their abdominal bloating was not related to any other gastric symptoms. Bloating is the buildup of gas in the stomach, which causes its swelling or enlargement. It provokes an uncomfortable feeling of fullness and may be accompanied by abdominal pain and the urge to expel some gas. For some people, abdominal bloating is merely an occasional nuisance than can easily be avoided or that doesn't cause much discomfort. Other people experience it regularly and must always look for a way to avoid the pain and the social embarrassment. It is difficult to accurately establish the different types of abdominal bloating. However, there are three criteria that can help identify ways in which this symptom may vary: frequency, durations and intensity. 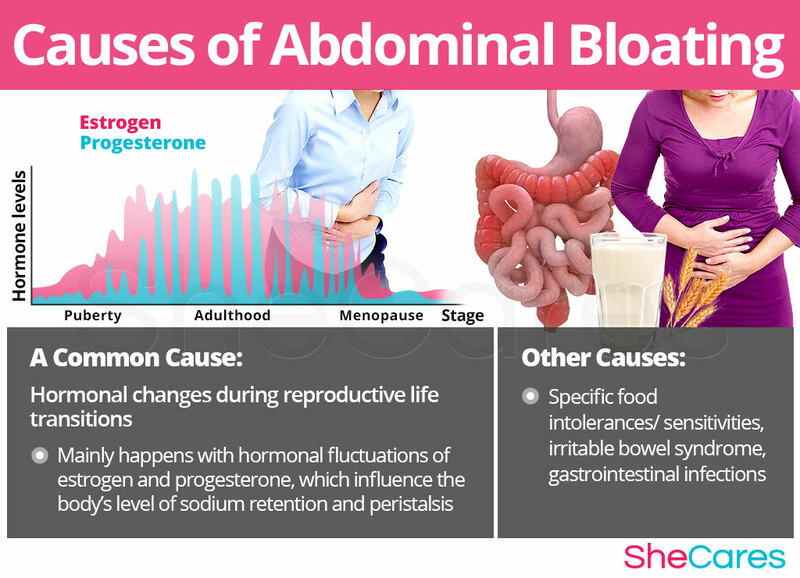 In order to understand the processes behind abdominal bloating, continue on to the next section to read about their hormonal and non-hormonal causes. Learning about the causes of bloating provides the key to understanding how to prevent and treat these troublesome attacks. While the exact causes of abdominal bloating are complex and diverse, most doctors and researchers believe hormonal changes are the primary cause in women of reproductive age. In addition to these completely normal hormonal causes, other factors and medical conditions can, in more rare instances, cause abdominal bloating. Continue reading to learn more about both hormonal and other causes of bloating. Hormones are chemical messengers that control every organ in the body. Therefore, when changes in these hormone levels occur, certain health disorders can arise. Medical researchers have found that fluctuating levels of hormones, especially estrogen, make women more susceptible to symptoms of abdominal bloating and digestive problems. This is because estrogen and progesterone influence the body's level of sodium retention as well as the function of peristalsis, or intestinal movements, designed to make food pass smoothly through the digestive tract. This is the reason why more women experience bloating and digestive distress during times of significant hormonal imbalance - puberty, PMS, menstruation, pregnancy, post-partum, and menopause. The fluctuation in progesterone levels during these stages causes abdominal bloating to increase. Furthermore, there are also specific hormonal causes and typical environmental factors which can explain the occurrence of abdominal bloating according to the stage of a woman's reproductive life in which this disorder appears, such as around PMS and during puberty, pregnancy, post-partum, and menopause. Puberty is the stage in which a girl's body begins to produce reproductive hormones; these and other factors, such as drastic body changes, contribute to abdominal bloating during puberty. Pregnancy leads to extreme changes in the production of reproductive hormones, which along with other factors, like fatigue or food cravings, can lead to abdominal bloating. Post-partum and breastfeeding is another stage where reproductive hormones are imbalanced, leading to symptoms like abdominal bloating- Also, other factors contribute to abdominal bloating in postpartum, like diastesis recti. Menopause is the stage in a woman's life when production of reproductive hormones naturally declines, signaling the end of a woman's fertility. As well as hormonal imbalance, other factors that can affect abdominal bloating are menopausal weight fluctuations and the problems with assimilation that are a natural part of aging. While hormonal imbalance is the major underlying cause of abdominal bloating during a woman's life, experts also point out digestive disturbances may be caused by other, less common, underlying conditions including thyroid conditions, sleep disorders, and as a side effect of certain types of medication. Gastrointestinal infections. Different types of stomach infections, such as H. Pylori, are a common cause of severe bloating, gasses and – in more acute cases – diarrhea. Irritable Bowel Syndrome. This condition of unknown causes is characterized by chronic abdominal pain or cramping, bloating, constipation, and other bowel function issues. Celiac disease. This is a congenital autoimmune disease that renders some people unable to digest gluten and causes bloating, extreme fatigue, fever, and even blackened stools when wheat, barley, or soy are consumed. Specific food intolerances. Some people naturally have problems digesting certain types of food, and their ingestion causes bloating. The most common food intolerances include lactose, wheat, and specific food additives. Some women are more likely than others to suffer from symptoms of abdominal bloating because of inherent psychological, behavioral, and health reasons - such as obesity, stress, or a specific family history. These predisposing factors can affects a woman's hormone levels and increase the chances of developing abdominal bloating during and after her reproductive life. Obesity. A study in the U.S. found that obese women, whom are those with a body mass index of over 30, were three times more likely to suffer from the effects of PMS than the average woman. Abdominal bloating is one of the primary symptoms of PMS. Chronic use of prescription or OTC drugs. Many prescription drugs such as sleeping pills, anti-depressants, and painkillers often list abdominal bloating or other types of digestive distress as a side effect. However, some over the counter pills that are generally regarded as risk-free, such as aspirin, can also increase the risk of bloating. Family history. Women with a first degree relative who suffers from Irritable Bowel Syndrome are more likely to develop the disorder themselves, and to suffer from generalized digestive problems throughout their lives. Primary lactose intolerance. This is a genetic inability to produce sufficient amounts of lactase, an enzyme that allows the body to digest milk. This condition usually develops on its own after the age of 5, and it is estimated to affect up to 75% of the world's population to some degree. It causes severe bloating, passing of gas and stomach growling after consuming dairy products. Nicotine dependency and smoking. Several studies point out that people who smoke tobacco on a regular basis are more likely to suffer from abdominal bloating and gastritis, because nicotine increases the amount of stomach acids, which eventually start damaging the lining and creating severe discomfort, bloating and pain. 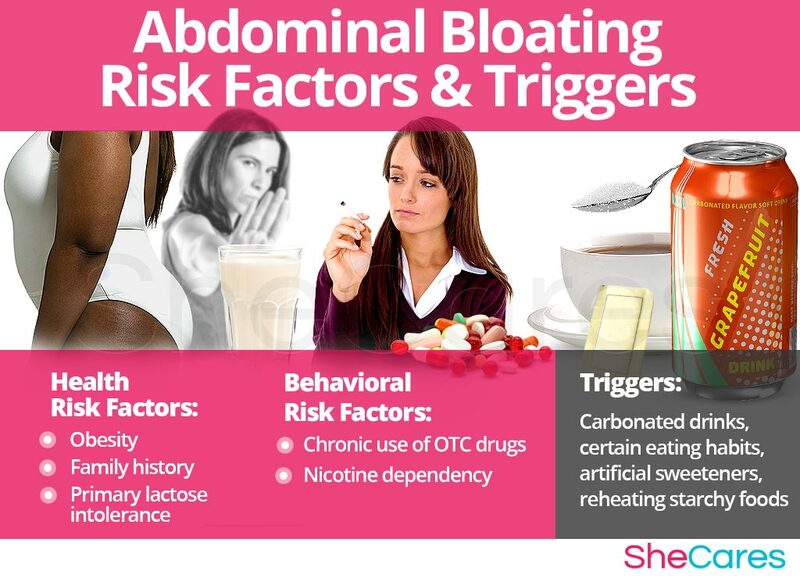 In addition to long-term risk factors, abdominal bloating can also be triggered by certain environmental factors and behavioral habits. Avoiding these unhealthy environments or habits as much as possible may help to avoid the onset of mood-related symptoms. These include habits like drinking carbonated beverages and keeping a stomach-irritating diet, as well as other external triggers. Carbonated drinks. Sodas, energy drinks, and carbonated waters can cause an immediate irritation of the stomach lining, as well as increase the amount of gas in the abdominal cavity, adding to the discomfort. Certain methods of eating. Chewing gum, using straws to drink, or talking while eating can cause someone to swallow more air than usual, triggering bloating and discomfort. Artificial sweeteners. Using artificial sweeteners that contain sorbitol or xylitol (Splenda, Equal, etc.) can trigger a bacterial overgrowth inside the stomach. Although stomach bacteria are usually healthy and necessary for digestion, they must remain carefully balanced. If this balance gets disrupted, problems with digestion may arise, and excessive gas production occurs. Reheating starchy foods. Certain foods like potatoes, pasta, and rice contain large amounts of starch, which breaks down slightly when reheated and becomes harder to digest. Eating irritating foods. Many people have special sensitivities towards some types of food, which may be triggering bloating. Certain vegetables like beans, Brussels sprouts, or cabbage can trigger excessive gas production for some people. Likewise, seasonings such as cayenne pepper, curry, cumin, or mustard may be particularly aggressive on some people's stomach lining. Because each woman has her own individual way of managing her diet and judges the amount of discomfort she is experiencing under a different standard, each one will experience abdominal bloating to a different degree. 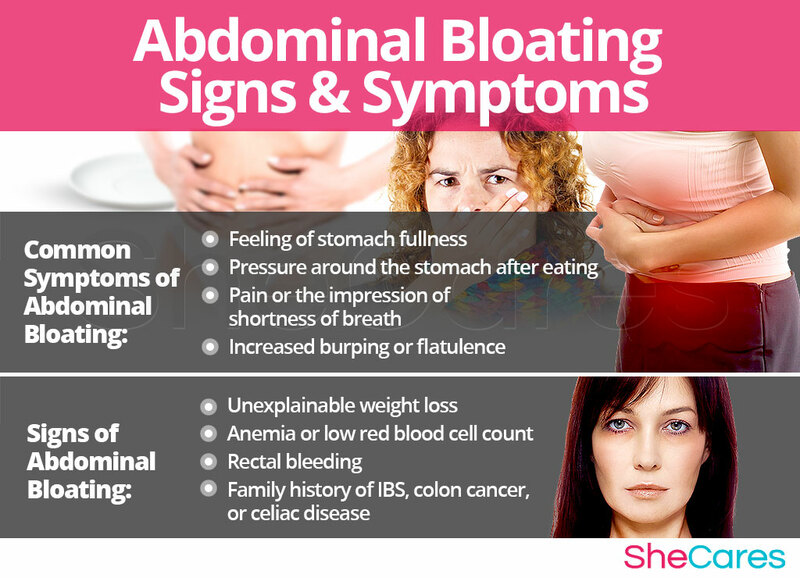 However, many symptoms of abdominal bloating are very similar in nature, especially among women undergoing hormonal imbalance. A family history of Irritable Bowel Syndrome (IBS), colon cancer, or celiac disease. To diagnose and identify the symptoms of abdominal bloating, a doctor must typically perform three procedures. First, he or she should review the patient's medical history, then conduct a physical exam, and finally order additional tests, if necessary. Medical history. A doctor's diagnosis will focus on discovering the underlying condition that is causing the frequent bloating. To assess whether a woman's abdominal bloating is symptomatic of a hormonal issue or another health concern, a doctor may ask about previous medical conditions, any medication being taken, and current life events (e.g. entering puberty, becoming pregnant, or beginning or ending menopause). Physical exam. This will often be necessary for a doctor to make a diagnosis. During this exam, a woman can expect the following medical signs to be measured: blood pressure, heart rate, temperature, and weight. Unusual or abnormal fluctuations in these vital signs can be related to digestive problems and may be symptomatic of another condition. Tests. Different tests may be conducted in order to confirm or rule out other conditions. These may include blood and urine analyses, like a complete blood panel, serum levels of follicle stimulating hormone (LH), thyroid stimulating hormone (TSH), or other specific signs of hormonal imbalance. If absorption problems are suspected, the doctor may also want to measure calcium or vitamin B12 levels. A stool sample may be requested as well in order to rule out infections like Helicobacter Pylori. Women who experience frequent problems with abdominal bloating that are interfering with their daily lives may wish to treat or learn how to prevent them. Keep reading below to learn useful techniques and habits that will prevent abdominal bloating or make it more manageable. While there is no single way to completely prevent abdominal bloating, just as there is no way to stave off natural hormonal processes, there are a few steps that a woman can take to reduce her chances of experiencing it, or to minimize the frequency and intensity of its episodes. Lifestyle changes for prevention are extremely important, especially in regard to diet, exercise, and healthy habits. Moreover, women may seek ways to complement these lifestyle approaches with the use of supplements that help enhance the endocrine system and, therefore, help prevent or ease symptoms of hormonal imbalance, such as abdominal bloating. Diet. Maintaining a healthy, well-balanced, and nutritious diet is very important to prevent abdominal bloating, as well as to promote a healthy weight and prevent the onset of further conditions. Women can also prevent the disorder by eating foods rich in calcium, magnesium, or vitamin E, such as cold-pressed oils, green leafy vegetables, and nuts along with whole grains and fresh vegetables. Exercise. Regular physical activity can help in maintaining a healthy weight and also promote the health of the endocrine system, which is responsible for balancing hormones. Research shows that the benefits of exercise are many, including stronger bones and muscles, lower cholesterol, better sleep, and fewer episodes of abdominal bloating. Habits. Research indicates that women who smoke cigarettes and consume alcohol frequently are more likely to develop more severe symptoms of hormonal imbalance. Therefore, avoiding or minimizing the consumption of these substances is desirable. In addition, food and drinks high in sugar and/or caffeine can trigger abdominal bloating. Moreover, high levels of stress may play an important role in hormone levels. So, it is important to use appropriate techniques to manage stress to prevent the onset or “flare-ups” of abdominal bloating. Supplements. An adequate intake of iron, magnesium, zinc, folic acid, and omega-3 fatty acids in the diet through taking a daily multivitamin is recommended to prevent abdominal bloating. Also, some phytoestrogenic herbs, such as black cohosh or ginseng, may be helpful in preventing abdominal bloating naturally, although it is not advisable to use them for a prolonged period of time. Additionally, another good option is herbal supplements that support the hormonal system, such as Macafem. Supplements such as this one nourish the hormonal glands and endocrine system as a whole, supporting its optimal functioning and thus helping prevent abdominal bloating. For women who are already experiencing abdominal bloating, prevention may not be possible if the symptoms have already appeared. Fortunately, there are many ways to manage them in order to prevent these “flare-ups” or to lessen the intensity of the symptoms. Keep reading to learn about the different ways to manage abdominal bloating. Wherever a woman happens to be when experiencing abdominal bloating or other types of digestive problems, there are effective ways to instantly manage the symptom. Making minor daily changes and avoiding triggers can make huge different for women who are trying to manage abdominal bloating. There are certain tips and tricks available that can help improve the experience of abdominal bloating, giving women the tools they need to cope with the uncomfortable feeling of abdominal fullness or the urge to pass some wind. There are general tips that women of all ages can use, including foods to avoid, or keeping more careful track of symptoms. Keeping a tummy diary. 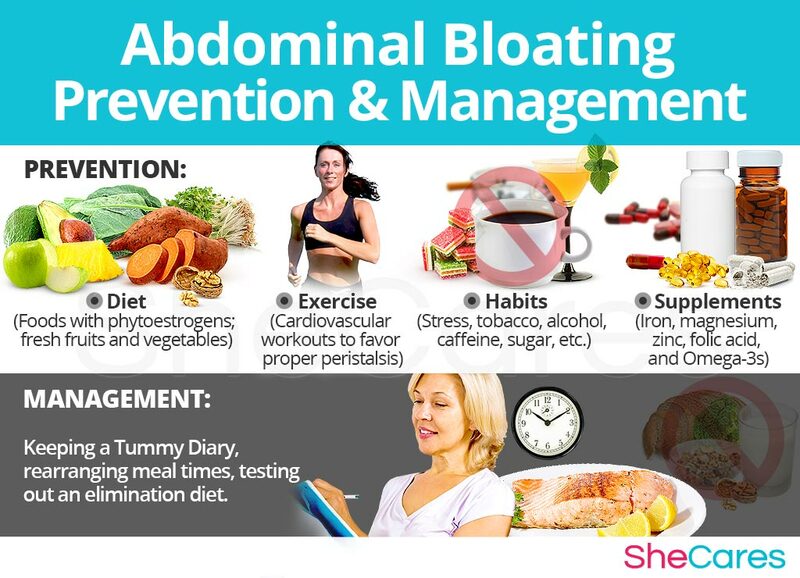 Keep track of any food eaten, daily exercise amounts, hours of sleep, and any unusual stressful situations experienced surrounding the presence of symptoms of abdominal bloating. This will help in identifying if there is a common trigger. Re-arranging the time of meals. In addition of cutting down on beans, Brussels sprouts, and strong spices, it's best to try eating five or six small meals during the day instead of two or three large ones. This makes digestion easier for the body and minimizes the production of gas. Testing out an elimination diet. Many women could have developed lactose intolerance, or they could be intolerant to other common food ingredients without being aware of it. Women who suspect lactose or a similar intolerance can try eliminating dairy, gluten, eggs, or nuts from their diet altogether for two or three weeks to see if the symptoms change. If there is improvement, the next step is to reintroduce these ingredients, one by one, and be alert for any recurrence of abdominal bloating. Alternative treatments are also a great way to manage frequent abdominal bloating. These treatments will not tackle the hormonal cause behind most women's mood swings, but they are effective in reducing stress in the short and medium term. Alternative treatments include massage and acupuncture. Massage. In general, massages help support digestion, stimulate bowel movements, and relieve symptoms of abdominal tightness, cramping, and bloating. Acupuncture. Acupuncture treatments can stabilize bodily functions by placing needles to stimulate specific points in the body. If you notice yourself getting bloated on your period, it's most likely because of changes in estrogen. Estrogen affects water retention as well as the body's ability to digest fats, which means that changes in your estrogen level during the menstrual cycle can affect bloating. 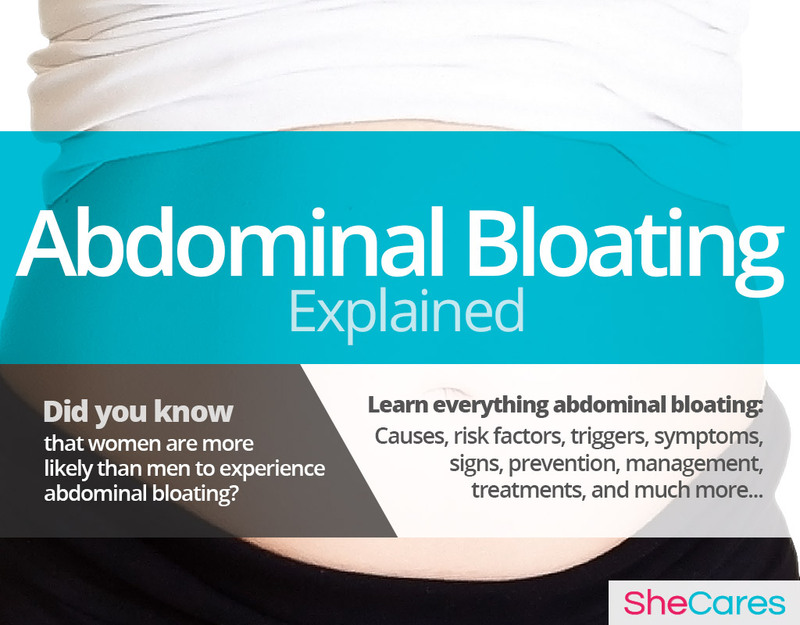 Many times, abdominal bloating may become inevitable at some point of a woman's life. While there is no magical fix, it is more than possible to find an effective treatment for abdominal bloating. 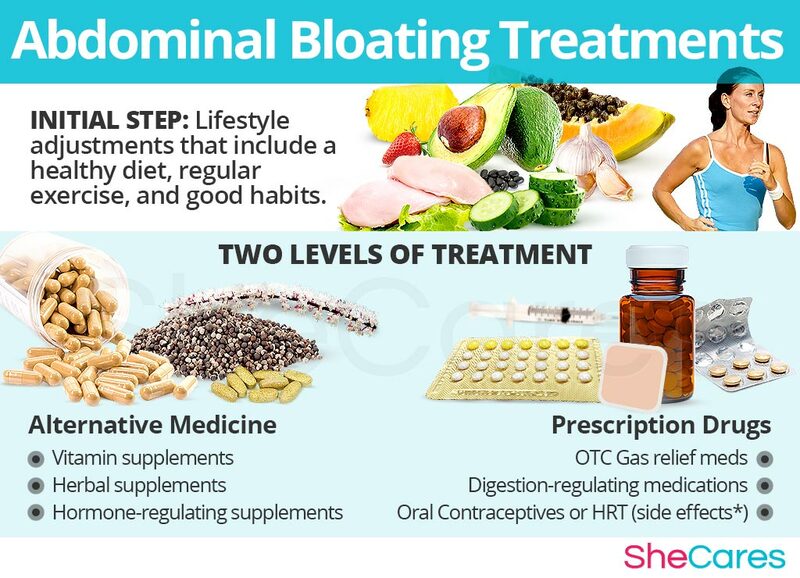 Three levels of approaches can be considered for treating bloating. These are categorized as: (1) Lifestyle Changes, (2) Alternative Medicine and (3) Pharmaceutical Options. It is recommended that a woman begins with the least risky option to abdominal bloating treatment, lifestyle changes, before progressing to the next stage of care. While medical intervention is not usually necessary to treat abdominal bloating, some women who are unable to find relief from lifestyle changes and alternative medicine may wish to consider pharmaceutical options, after properly assessing the risks associated with such a treatment. This primary level of treatment involves the least amount of risk, though conversely it requires the highest amount of self-discipline. Simple changes in lifestyle can reap huge benefits in fighting bloating and achieving a higher overall level of health. Fundamentally, an improved diet, regular exercise, and healthy habits can do a woman great service. Nutrition. Diet is of extreme importance in regulating abdominal bloating. By eating a balanced diet rich in hormone-regulating foods and avoiding foods that can irritate the stomach lining or provoke intolerance, it is possible to stabilize digestive function to some degree. Foods that contain phytoestrogens. Foods that contain phytoestrogens can help supplement estrogen deficiencies in women - especially during menopause. The food most commonly known to contain phytoestrogens is soy; however, beans, peas, lentils, seeds, flaxseed, rye, and millet also contain these plant estrogens. Fruits and vegetables. Increasing the amount of water-rich fruits and vegetables can help regulate stomach function and get rid of frequent symptoms of abdominal bloating. Lean animal protein. Including extra lean protein from animal sources — such as chicken breasts, turkey, or fish — instead of cured meats or excessive amounts of starch and sugar can help in significantly reducing the frequency of bouts of abdominal bloating. Regular exercise. Because hormonal imbalance is so often behind severe and frequent episodes of abdominal bloating, increasing the amount of daily physical activity can be of great help. Cardiovascular workouts like power walking, aerobics, jogging, or cycling are particularly good because they involve moving the entire body, which favors proper peristalsis. Healthy habits. Some habits can be particularly harmful for those suffering from abdominal bloating. Research indicates that women who smoke cigarettes are much more likely to develop symptoms of hormonal imbalance, and to develop other conditions, such as gastritis, that can worsen abdominal bloating. Women should also avoid chewing gum and talking with their mouths full because they can cause them to swallow too much air; maintain a healthy weight; reduce stress; and sleep at least seven hours a night in order to help hormonal balance. While these changes will help alleviate abdominal bloating, they do not directly address hormonal imbalance, the most common cause of recurrent abdominal bloating in women of reproductive age. So, further treatment may be necessary. Alternative medicine has proven to be an excellent way of treating abdominal bloating related to hormonal imbalance in a safe and natural way. Alternative medicines and supplements involve little to no risk and can be an extremely effective way to treat abdominal bloating. In the case of herbal supplements, there are two main types that can be used: phytoestrogenic and hormone-regulating herbal supplements. These supplements, such as black cohosh or vitex chasteberry, contain estrogenic components produced by plants that complement the low estrogen hormones in a woman's body, helping alleviate abdominal bloating. By introducing plant-based estrogens into the body, these herbs treat the underlying estrogen deficiency behind abdominal bloating. These supplements can be considered the safest and most natural way to treat the underlying hormonal imbalance behind abdominal bloating, and can be taken throughout a woman's life, as they support the body's natural hormone production. Additionally, there are some other types of supplements that can also alleviate abdominal bloating, or at least make it more manageable, including vitamins and other herbal supplements. Vitamin supplements. There are some specific vitamins that can help control digestive problems and lower abdominal bloating. For example, vitamin B6 (pyridoxine) can help reduce bloating and promote good digestion. While this vitamin may be difficult to find by itself at health stores, a B-complex vitamin can be found easily and taken to achieve personal balance. Other herbal supplements. Evidence exists that certain herbal supplements can minimize abdominal bloating. For example, ginger acts by reducing inflammation; peppermint and basil provide immediate relief against gas and stomach cramps, and clove oil before meals is claimed to lessen abdominal bloating in the following hours. A combination of approaches is usually the most effective route to take. Lifestyle changes combined with alternative medicine will most likely be the best way to alleviate the symptoms of abdominal bloating. However, for some women the symptoms will be so severe that a more drastic treatment is necessary. Interventions at the third level involve the highest risk and often the highest cost. Not all treatments are suitable for women at every life stage, so it is strongly recommended to speak to a licensed healthcare practitioner before starting any pharmaceutical treatments for abdominal bloating. There are two main types of pharmaceutical options that can be prescribed to treat abdominal bloating: hormone-regulating medication and digestion-regulating medication. Hormonal replacement therapy (HRT). HRT is a quick and strong way to combat abdominal bloating as a symptom of menopause; however, it can entail serious side effects, and it is linked with an increased risk of certain reproductive types of cancer along with an increased risk of blood clots and cardiovascular disease. This treatment is predominantly reserved for women experiencing hormonal imbalance related to menopause. Oral contraceptives. When abdominal bloating is related to PMS, it may be possible to control it by using oral contraceptives, as this can help to avoid severe bloating by stabilizing hormone levels throughout the menstrual cycle. However, this option is not suitable for women who are pregnant or breastfeeding. Digestion-regulating medication. Most medication in this category is aimed towards symptom-relief rather than dealing with any underlying condition and include antacids like Mylanta, Gelusil, or loperamide. Over-the-counter, gas relief medications. Products such as Beano® and those that contain simethicone (such as Gas-X®) are widely available for abdominal bloating relief; moreover, other over-the-counter medications – like lactase supplements exclusively for lactose intolerance – are also available to alleviate abdominal bloating caused by certain sensitivities. These three approaches are not mutually exclusive. A woman may use different approaches at different times or any combination of them, depending on the duration and severity of symptoms. Today, more and more women find that dealing with symptoms of hormonal imbalance is best accomplished via a combination of healthy lifestyle and alternative treatments. Bernstein, C. & Takoudes, T.C. (Eds.). (2017). Medical Problems During Pregnancy: A Comprehensive Clinical Guide. Switzerland: Springer International Publishing. Available from Google Books. Carlson, K.J. et al. (2004). The New Harvard Guide to Women's Health. Massachusetts: Harvard University Press. Available from Google Books. Horn, J. & Miller, R.H. (2008). The Smart Woman's Guide to Midlife and Beyond. California: New Harbinger Publications. Available from Google Books. Simon, C. et al. (2014). Oxford Handbook of General Practice, Fourth Edition. United Kingdom: Oxford University Press. Available from Google Books.